So there I was, standing in front of an audience, wearing a headset and my voice booming out through large speakers, when suddenly, two minutes into my talk, the screen goes blank! I was giving a presentation called “Fidelity of Moisture Status in the Pharmaceutical Supply Chain” at a conference in Dublin. Nothing else for it, with no slides to show, I switched to talking about “Moisture Matters”. After a few minutes talking about the way materials interact with moisture, I brought my talk back towards the theme of my presentation. With about five minutes left, the screen came back on and I flicked through the key slides at speed, highlighting the points I had just talked about. 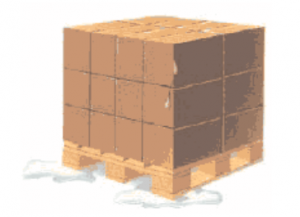 A further twist in events was that the next speaker, who was talking about getting the right packaging for transporting products, started showing pictures of cardboard boxes and mentioned that magic word to my ears “humidity”.…….. Nothing surprising in mentioning humidity when choosing packaging, as we know some products need to be protected from moisture. The really interesting bit for me was the speaker talking about humidity and the problems it causes with “adhesives” used to stick cardboard boxes together. Obviously, if the adhesive doesn’t work, your cardboard box carrying your product falls apart. This does not inspire confidence in the product, especially if you’re the customer. Naturally, when I got home, I started researching adhesives used for cardboard boxes and effects of humidity. Some information that popped up is similar to the effects of moisture on paper. I talked about storage of paper and the printing facility environment in my previous blog. Since the raw material for cardboard and paper is wood fibres then it can be expected that both react in much the same way when exposed to changes in humidity. Most of the information offered by my Google search was about how cardboard is made. I never thought about this before, but then, why would you? Cardboard is made using flat sheets of paper as “liner” and a shaped paper sheet called the “flute”. Each layer of cardboard consists of a flute sandwiched between two liners. Of course these layers have to be stuck together and that is done using adhesive. In the picture you’ll see where part of a liner has been removed showing the flute below. Because the liner has been forcibly torn off, the surface of the flute is rough where the adhesive attached the two layers. Any, or all of these parts (liner, flute and adhesive) can be affected by moisture depending on the humidity at the time of making the cardboard. But, as interesting as this may be, it is a diversion from my search to find out about adhesives and cardboard boxes falling apart. At this point in my search I was struggling to find a simple report or studies on moisture affecting adhesives or glues used for cardboard boxes. However, there are some detailed published scientific studies and online resources describing moisture reducing the bonding strength of adhesives. Also, people have investigated adhesives used for bonding wood. Two wood adhesives with increasing popularity are polyvinyl acetate (PVAc) and polyurethane (PUR). Why the popularity of PVAc and PUR? They do not contain formaldehyde which is volatile, banned for use in food containers and best avoided anyway. These two adhesives are also used for gluing the edges of cardboard boxes. If you think about it the fibres in cardboard that are bonded by the adhesive are the same as in wood. When cardboard is stored at high humidity, moisture uptake happens and this weakens the bonding strength of the adhesive when applied to form the edges of the box. Even when a strong bond is formed along the edges, high humidity causes moisture to enter the adhesive and can change it chemically and physically weaken its bonding. 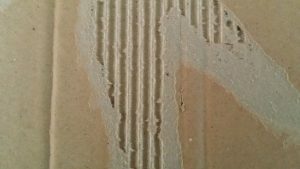 High humidity drives moisture between the adhesive and the surface of the cardboard, breaking down the bond. There is a fourth level but nothing to do with the glued edges. 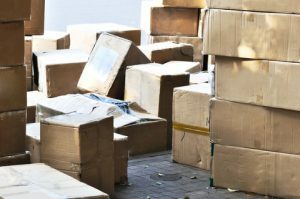 The courier company UPS have done studies that show a 60% reduction in the strength of cardboard itself at high humidity. This is important because if a cardboard box has been exposed to high humidity it should not be reused but sent for recycling. UPS provide a cold storage transportation service and if you read the first two chapters of my eBook you will understand why the reduced temperature has a big impact on humidity.